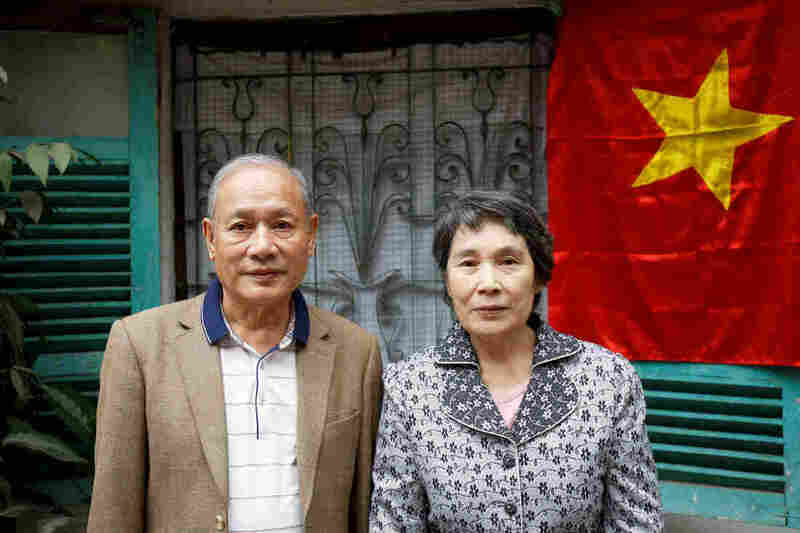 Pham Ngoc Canh, from Vietnam, met his North Korean wife Ri Yong Hui in 1971. They finally were able to marry in 2002 and now live in Hanoi. A couple in Hanoi is watching the summit between President Trump and North Korean leader Kim Jong Un this week with particular interest. The husband, from Vietnam, and the wife, from North Korea, had to overcome enormous obstacles to be together. Their love was forbidden for decades by authorities on both sides. But eventually, they triumphed. “It was love at first sight for me. I fell for him immediately,” recalls Ri Yong Hui, 70, of her Vietnamese husband, 69-year-old Pham Ngoc Canh. The two are sitting on the sofa in their modest, Soviet-era apartment in Hanoi, speaking of the time back in the early 1970s when they first spotted each other working at a fertilizer plant in North Korea. It was a bold statement, given North Korea’s xenophobic reputation. He didn’t much care. “I’m not afraid of anything,” he says. Canh started his campaign to woo Ri by watching her movements to figure out her schedule. He arranged to casually bump into her in the hallway. He said hi. She said hi back. And that gave him the courage to take the next step. “I took a handkerchief I’d bought in Beijing and a photo of me taken with two of my friends,” he says. He snuck into her lab when no one else was there and asked if she had a boyfriend. She said no. He then presented her with the gift and asked if he could visit her home. She said yes. He continued these visits about once a week, he says, for the remainder of his stay — about another year. Both of them were fully aware of the danger of being caught by the authorities. And he did, several times in the next five years, wrangling invitations to be part of visiting delegations or offering to translate for others. The two sent letters, surreptitiously, in an era long before smartphones and texting. But letters sometimes went awry. Canh remembers taking a trip to North Korea in the late 1970s and sending Ri a letter, asking her to meet. It arrived a week too late. But they were still able to meet before he left. Sometimes, when relations between the two countries soured, or when they thought the security services were onto them, the letters stopped. So did the visits. Starting in the late 1980s, the couple had no direct communication for more than a decade. But there were other things on Ri’s mind in those years. 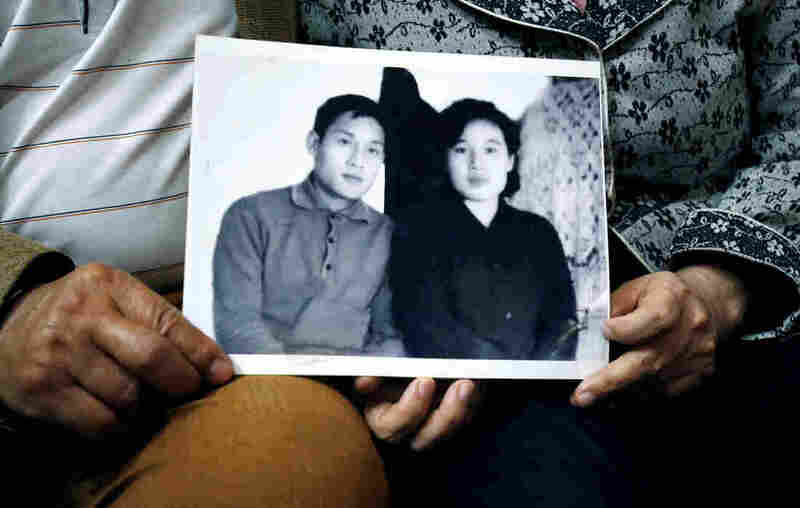 Pham Ngoc Canh and his wife Ri Yong Hui hold a photo from their early days of courtship in 1971, when he was in North Korea on an internship. “My country back then,” she remembers, “every day was a struggle, every day people were on the brink of starvation since the 90s, because of the Arduous March.” That’s the term North Koreans use to refer to the famine that gripped their country, taking hundreds of thousands and perhaps millions of lives, including her mother’s. He set up a Vietnam-North Korea friendship committee, raised money for a 7-ton of donation of rice and reached out to North Korean contacts in Hanoi. In 2001, he made an audacious move, using connections in the Foreign Ministry to deliver a letter pleading his case to Vietnam’s president — who was about to leave on a state visit to North Korea. A few weeks later, a friend told him his gambit had worked. In late 2002, after the couple had waited 30 years, North Korea took the rare step of allowing one of its citizens to marry a foreigner. There was a small ceremony in Pyongyang. Then Canh brought his wife back to her new home in Hanoi, where a bigger ceremony took place, with hundreds attending. As the two of them sit on the sofa now, gently touching each other on the arm as they speak, they seem every bit as in love as they describe being back in 1971, when they first met. They don’t have much money, she says — she wishes they did so she could help her country more. Her husband just smiles. “No regrets,” he says gently. “I still feel the same now as I did then.” And, he says proudly, he was able to convince a country with nuclear weapons to change its mind.